You can’t imagine dynamic Scottish artist David Mach setting out to justify religion or to make the bible “relevant for today”. True to form this massive exhibition in Edinburgh is a celebration of what is to be human, rather than a theology lesson. Leaving aside for a moment the massive steel crucifixion which looms out through the window of Edinburgh’s City Arts Centre and several of David Mach’s signature matchstick heads, the main works in this spectacular show are huge, cinematic, seething collages illustrating stories from the Bible. The texture of history, as Mach reports it, is both crowded and eventful. It is as if Breughel's village scenes were transposed to today’s global village, to include people of every race, colour and creed. 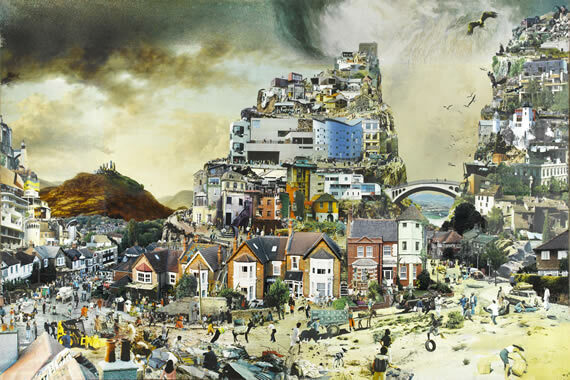 Mach positions the Old Testament’s blockbuster events – the building of the Tower of Babel, Noah’s Ark, the Plagues of Egypt – in the present with a contemporary dramatic feel. Mary is shown moments after the birth, on a filthy bed in a bombed out house in a devastated landscape, as Joseph struggles to pull a piece of plastic over the roof. Outside Stormont Castle in Belfast, hundreds of “Egyptians” gasp and run as they are deluged with every possible kind of frog, alongside a rain of consumer products and household stuff, making a contemporary economic quip. A hermaphrodite Jesus is crucified in a modern sci-fi movie, where in a tragic Terminator moment, the ruined body is transformed into a machine robot. The collages are scissored from hundreds of magazines, but care is taken to make sure they are all in perfect scale. There is nothing surrealist about the juxtapositions, even though seeing the Tower of Babel capped with several of the new loft apartment blocks that recently sprung up outside Tate Modern is definitely surreal. Stealing extensively from contemporary Hollywood, the collages switch camera angles and viewpoints. We see the end of the world through the eye of God; we are sitting next a barnacle-encrusted Jonah, looking out at land through the whale’s gaping mouth; we are inside the car with a family desperately trying to escape from the wreck of Jericho, as a man’s terrified face looks in and his hand smears blood down the window. As in real life the pictures show inequality of suffering; in one corner people will be crashing and burning whilst on the other side of the giant collage, they are smiling and pointing. Mach has said he set out to situate the Bible in the present, and offer “a presentation of the very nature of the world we now live in”. He gives us some contemporary hells, graphically shiny and magazine-retouch perfect, and therefore doubly disconcerting, even upsetting. You can see hell as wilding in Dublin, gruesomeness in Tokyo or very satisfyingly Disneyland. Is it surprising that the least successful of the collages are the Breughelesque Four Seasons in Heaven? They are altogether too “barefoot in the park” to be believable or tempting. On the 3rd floor of the City Arts Centre, Mach and his team are working on the final collage – The Last Supper. A student was meticulously scalpeling out holes from a photographic print of a lace tablecloth. She explained that every single element must be cut carefully into those adjacent to it, as the glue will only work if it is stuck direct on the mdf base. It is a labour of love but worth it as this medium gives an entirely different texture and feel than if it was created in Photoshop. But what a labour. It is not surprising that Mach returns again and again in the show to the subject of Noah’s Ark, which in his vision is being constructed by hundreds of people co-operating together. Much more Transition Town than the gloomy bible version where every human is swept away in the flood, except Noah and his family. The absence of “cool” has turned some critics against this show. Good for Mach for denouncing this overvalued commodity. The exhibition was packed with ordinary viewers and children looking intently at the works. The history of the King James Bible is fascinating in itself. King James the VIth of Scotland and Ist of England, permitted an authorised version of the bible to be published in English in order to stop revolutionary Puritans from doing it themselves. He put together a commission of 54 theologians, representing all the wings of the church, to arrive at an agreed state version of gospel truth. It was part of his attempt to hold back the tide of revolutionary change that was growing in England. James was quite an adept at playing both sides against the middle, a skill his son Charles 1st did not inherit! The first English translation of the Bible was actually by William Tyndale in the early 16th century and as a result he was tried for heresy, strangled and burnt at the stake in 1536. The Tyndale Bible, as it was known, continued to play a key role in spreading Reformation ideas across Europe. Poor man, he paid a terrible price for being 100 years ahead of his time but in fact much of the authorised version comes from his work. And as projections on the wall of the exhibition remind us, he will be remembered forever through dozens of phrases people still use: “a drop in the bucket”’, “a fly in the ointment”, “at his wits end”, “cast the first stone”, “beat swords into ploughshares” and so on. He is truly amongst the immortals! David Mach - Precious Light: a celebration of the King James Bible 1611-2011 at Edinburgh City Arts Centre until October 16.